The one most common reason behind most men back pain is a habit of keeping wallet in their back pockets and sitting on it while driving, working etc for an extensive period of time which forces the body posture specially the pelvis and spine out of position. 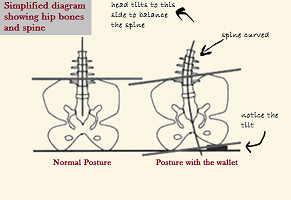 When one cheek is higher than the other you end up twisting the pelvis (look at the image below). Now our body automatically on impulse tries to correct by keeping the head positioned centrally on the pelvis which now needs turning and slanting of spine. 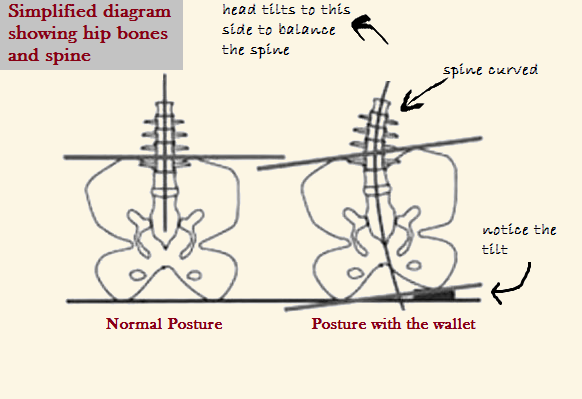 Due to this the spine becomes misaligned there is muscular imbalance which can be one of the reason of back pain. Then your shoulders slump and you get neck and shoulder pain. It may also lead to compress sciatic nerves and self-inflicted back pain due to sciatica. The healthiest option is to move that wallet to your front pocket. If you must keep you wallet in your back pocket you should remove it before you sit down.You should also keep your wallet as thin as possible. Even when it is in your front pocket a smaller wallet will be a benefit.